For super-fast continuous burst mode shots, maximum post-production workflow efficiency, and high-performance video recording, get SanDisk Extreme PRO SDXC UHS-II. This high-performance SDXC memory card boasts shot speeds up to 260MB/s* (1733X) and transfer speeds up to 300MB/s* (2000X). UHS Speed Class 3 (U3) supports of Full HD and cinema-quality 4K video recording . Optimised for cameras that support the new UHS-II standard, SanDisk Extreme PRO SDXC UHS-II cards deliver the uncompromising results that professional photographers demand. With UHS Speed Class 3 (U3) rating , SanDisk Extreme PRO SDXC UHS-II cards let you capture uninterrupted cinema-quality 4K and Full HD video . This makes them ideal for professionals recording extreme sports and other fast-action activities without dropping frames. SanDisk Extreme PRO SDXC UHS-II Cards are shockproof, temperature-proof, waterproof and X-ray-proof , so you can enjoy your adventures without worrying about the durability of your memory card. The amount of capacity you need depends on the types of files you have, how big they are, and how many there are. 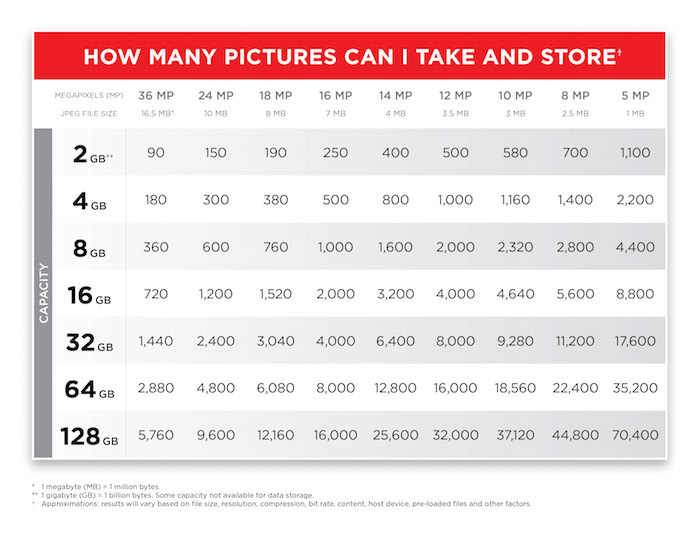 This chart gives you an idea of how much you can store.
. UHS Speed Class 3 (U3) designates a performance option designed to support real-time video recording with UHS enabled host devices. See www.sdcard.org/consumers/speed for additional details.
. Registration required; terms and conditions apply.
. 30 years warranty in Germany, Canada and regions not recognizing lifetime warranty. See www the Sandisk website.
. Card only. See product packaging and Sandisk website for additional information and limitations. Click the button below to add the SanDisk 128GB Extreme Pro SDXC UHS-II U3 Card. 300 MB/s Read 260MB/s Write. SDSDXPK-128G-GN4IN to your wish list.